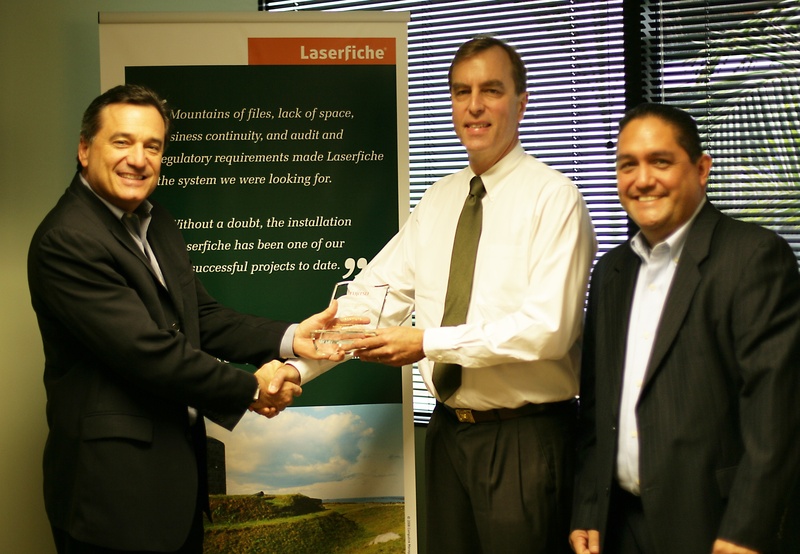 LONG BEACH, Calif., October 5, 2009—Laserfiche® today announced that Fujitsu Computer Products of America, Inc., a market leader in document imaging scanners and services, has awarded Laserfiche the quarterly Fujitsu ISV Innovative Award. Laserfiche was selected for creating a powerful Business Process Management (BPM) solution for Daviess County Prosecutor’s Office in Indiana. Each quarter the Innovative Leadership Award is given to independent software vendors (ISVs) that successfully leverage Fujitsu imaging products to optimize business processes and improve customers’ bottom line results. Laserfiche value-added reseller and consultant, Nancy Mathes of Paper-Lite, worked with Daviess County employees to create an electronic work process in Laserfiche that mirrors their processes with paper case files. Using Fujitsu fi-6130 scanners, staff scans documents directly into the Laserfiche content management repository, which dynamically creates case folders and places key identifying data such as case numbers and defendant names into template fields. At the end of the day, all scanned data is ready for full-text or template-field search and retrieval. Doug Rudolph, VP, Product Management and Business Development, Fujitsu Computer Products of America, Inc. (left) and Robert Esquivel, Jr., CDIA+, ISV Business Development Manager, Western Region Fujitsu Imaging Products Group (right) present Chris Wacker, Laserfiche Senior Vice President Business Development (center) with Fujitsu’s Independent Software Vendor Innovative Award. Once the office is ready to implement the integrated BPM functionality that is included with the Laserfiche Avante™ solution, Mathes plans to write a workflow rule that enables attorneys to automatically send necessary filing instructions and/or case files to support staff for additional processing. 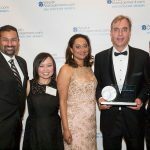 Fujitsu Computer Products of America, Inc. is an established leader in the Document Imaging industry, delivering innovative scanning solutions and services that enable our customers to solve critical business productivity issues and streamline operations. We provide cutting-edge document capture solutions for business and personal environments, backed by a comprehensive portfolio of service and support programs. For more information about Fujitsu Document Imaging solutions and services, visit https://us.fujitsu.com/fcpa or call us at 800-626-4686. Copyright 2009 Fujitsu Computer Products of America, Inc. All rights reserved. Fujitsu and the Fujitsu logo are registered trademarks and The Possibilities are Infinite is a trademark of Fujitsu Ltd. Statements herein are based on normal operating conditions and are not intended to create any implied warranty of merchantability or fitness for a particular purpose. Fujitsu Computer Products of America, Inc. reserves the right to modify at any time without notice these statements, our services, pricing, products, and their warranty and performance specifications.